This is how he likes to chill. 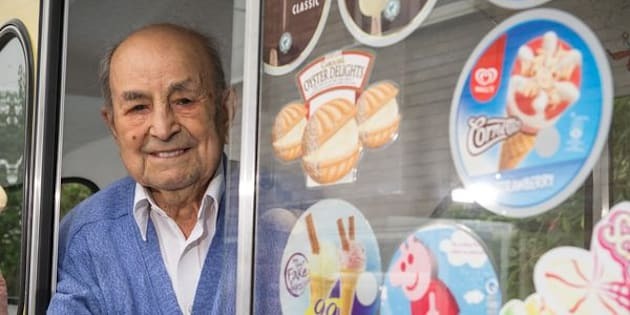 At 103, Givoanni Rozzo has become Britain's oldest ice cream man. When you’re 103 years old, you’ve earned the right to chill ― even literally, if that’s what you want. Givoanni Rozzo built a successful ice cream business in Cambridge, England, before retiring in 1995. Now he’s behind the wheel of an ice cream truck again, thanks to a birthday gift from his family: a fully restored Bedford HA like the one he drove in the 1960s, South West News Service reports. Restoring the vehicle cost the family nearly $20,000, but it’s pretty sweet, with a built-in freezer and a recording of “O Sole Mio” tinkling out over the speaker. Rozzo may be pleased about the gift, but Carl Rozzo, his grandson, said he doubts the aged ice cream man will work full-time. “I don’t imagine he’ll go out selling on the streets again, but he could maybe take it to special events, like weddings,” he told SWNS.